When Should You Use a Push Mower Vs. a Riding Mower? Many home owners wonder what type of lawn mower is right for them and their yards. Push mowers are certainly the lowest in price and fuel usage, but they are certainly more work. A riding mower seems like a more comfortable choice, but not always an economical or practical one. Here is a simple guide to deciding which is right for you – a riding mower or a push mower. The type of mower you need depends on the function you need for it to perform. In general, a push mower is best for smaller yards, especially those that are relatively flat. Intricate gardens or features. Riding mowers may have good turning radiuses, but nothing compared to a push mower. Plus, a push mower can get in and out of tight corners and other areas that a riding mower simply couldn’t access. Steep drops. Riding mowers are best for hills, but they can be downright frightening on truly steep lawns. Like any heavy object on its side, a riding mower may tip over, creating a dangerous situation. A self-propelled push mower will climb these slopes with no problem. A riding mower is meant for large, flat yards or those with gently sloping hills. Here are a few other situations where a riding mower is the likely choice for you. Fields or lawns of more than an acre. Your human operator may tire, but a riding mower will keep chugging in a relatively straight line. Extremely thick or damp grass. A push mower’s tiny bag can only hold so many clippings, which means that the operator will need to empty often, wasting time. If the bag fills up too much, it can choke the engine, which in the end leads to more expense. A riding mower has a larger bag and can plough through heavy grass without a problem. Areas with weeds or brush. No lawn mower is meant for these types of obstacles, but most will encounter them occasionally. A riding lawn mower has more weight and hence more momentum to push through difficult areas. Plus, the rider is positioned in a way that protects them from a spray of debris. Riding lawn mowers and push mowers come with very different price ranges. A standard push mower can be purchased for as little as $150. However, self-propelled push mowers can range from $500 to $900. If you plan to use your mower often, most homeowners consider the self-propelled mower well worth the extra cost. If you are looking at a riding lawn mower, you can plan to spend at least $1000 and even up to ten times that, depending on the brand you want and the amount of ‘extras’ you feel you need. The more expensive models are as comfortable as a car, with cup holders and cruise control. Another issue to consider is fuel and maintenance. A simple push mower will use the least gas and a riding mower the most, with a self-propelled push mower somewhere in between. The same goes for maintenance: less complicated machines have fewer parts and systems to maintain and repair. For push mowers, the most popular and generally highest ranked brands are Craftsman, Lawn Boy, and Cub Cadet. For self-propelled mowers, Craftsman is again a solid choice, with Toro and Honda also highly rated and relatively reasonably price. 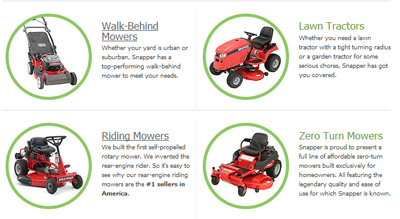 Riding lawn mowers are a different category altogether with different brands targeting the market. Toro and Craftsman again are popular choices, but brands such as Snapper and Poulan are well-liked and cost-efficient choices. You can buy a lawn mower from just about any store out there, from Sears to Home Depot to WalMart. Where you shop will depend on what you need. Discount stores will carry a narrow selection with a restricted range of features. While the prices are economical, the mowers are often specially made for that store and have a stripped-down warranty. Dealer stores offer the most options and often offer service contracts that will keep your mower in perfect working order for very little money. Dealer stores often offer as good or better prices than department stores, which are still popular choices. Used mowers are economical at the outset, but there are a few issues to consider. First, you may have difficulty getting replacement parts, especially if a model has been discontinued. You have no idea how the mower has been maintained and cared for, which means you may be getting only what you are paying for, or even less. The type and brand of lawn mower is right for you will depend on your yard as well as your personal strength and stamina. By considering the issues listed in this guide, you should be able to choose the lawn mower that is right for you with no trouble at all. Mine is a question. I have a customer concerned about the weight of my 60″ X-Mart. Any tips on what to tell her? I explained about the wider foot-print, compared to the smaller of the push mower, though I’m not certain where I had herd of that?